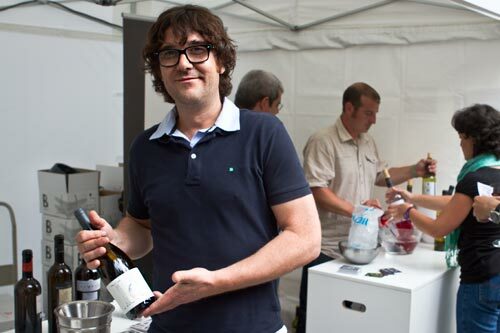 We managed to get a tasting of Altavins at the DO Terra Alta tasting in Barcelona two weeks ago. They were one of the stand-outs of the wineries and presented some quite enjoyable wines at quite reasonable prices. In the shot above, you can see their new labels on the left versus the old labels on the right. Obviously, it’s a bit of a departure. Those with a very sharp eye would note that the design style might seem similar to other wineries and that’s because it is. The designer is Lluís Serra i Pla who is the brother of Josep Serra i Pla, the owner of la Vinyeta up in Empordà who has some of the most remarkable label design in the region thanks to Lluís. Started in 2001, Altavins produces about 60,000 bottles of wine a year. We were chatted up the very friendly Joan Bautista Arrufí who is the enolog for the winery. They grow what are the rather standard varietals for the area, with an emphasis on their White Grenache as well as their other red grapes like Tempranillo, Carignan, Grenache, Syrah, Merlot, Cabernet Sauvignon and others. A good line up overall and the vines are showing their age well at this point. Almodí Blanc 2010 6€ is 100% White Grenache that sees four months in oak. They still consider it a young wine though. It’s quite round in the mouth and buttery. While verging on the edge of being complex, it’s a very enjoyable white and it begs to be paired with some kind of light dish. 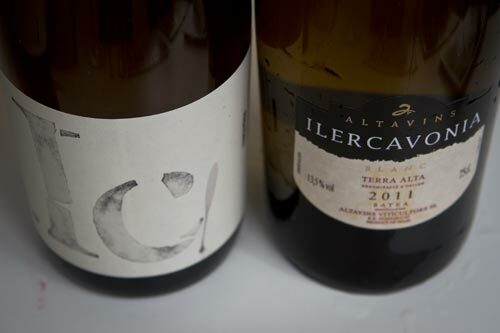 Ilercavonia 2011 8€ comes across a bit sweet like other White Grenaches from the Terra Alta region, but at the same time, it boasts a good deal of mineral elements as well. It comes up a bit buttery and while this may play well to those who like it in Chardonnay, I felt that it detracted a bit from what is an otherwise quite well set up wine. Tempus 2009 10€ is a Grenache, Syrah, Cabernet Sauvignon, and Carignan blend. It is wonderfully balanced across all aspects of drinking. It’s light on the palate, but at the same time quite deep and profound in the body. It never really lets you down as you work your way through the glass and it picks up a nice acidity in the finish. Good with food and great to drink solo–whether that means by itself or by yourself. Domus Pensi 2006 15€ blends up Grenache, Carignan, and a touch of Cabernet Sauvignon–although their website claims there is also a touch of Tempranillo in the bad boy as well. It’s strong and boasts large berry elements in the nose and the body. While not as smooth and seductive as the Tempus, it’s boldness plays out to the senses more and makes you take notice. Naturally, this makes sense given that it tips the scales at about 14.5% in the alcohol department. As you can see by the prices and the varietals on offer, these guys are balancing out their production and pricing quite well. Like it seems to be the case with most of the region, they’re definitely one to keep an eye on and one to buy if a bottle pops up in a store near you.